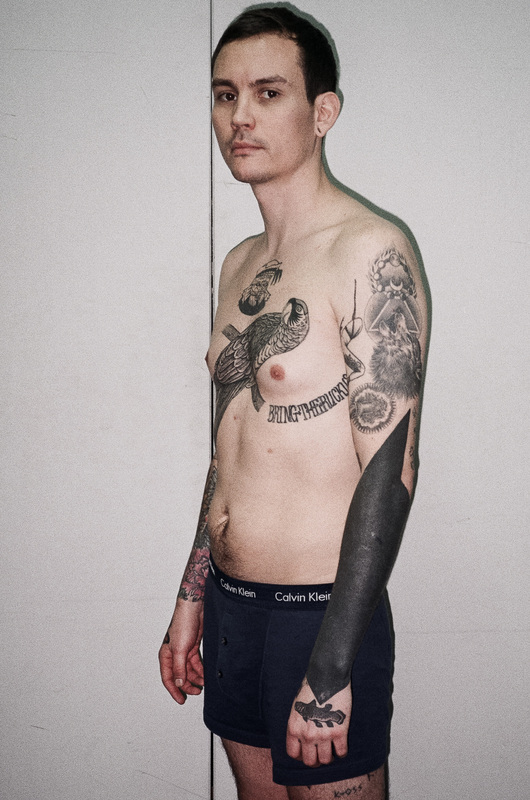 Born and raised in Glasgow, “during a time that the city had some of the highest unemployment and violent crime rates in the UK,” Grant McKenzie is a 31-year-old tattoo collector who works for a London-based digital creative agency. 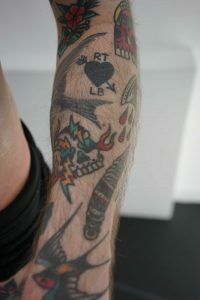 In this feature, Grant tells us about the highlights of his collection, as well as the ways his tattoos attract new people and reinforce existing social bonds. I started getting tattooed (very irresponsibly) when I was around 14. My first tattoo was in a shady studio in Glasgow, where the man who tattooed me smoked a cigarette while he worked. My initial interest in tattooing came from learning about 19th century Japanese artists such as Utagawa Kunisada and Toyohara Kunichika. 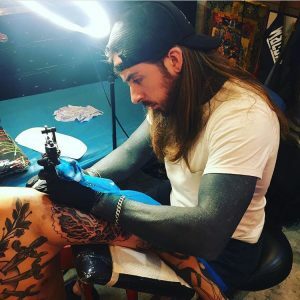 These artists depicted men covered in elaborate tattoos, I had seen tattoos on people for as long as I can remember, but this was the first time I gained a real interest in becoming tattooed myself. My first tattoos (which are all covered now) weren’t really thought through. When I first started to understand design and placement, I started working on a sleeve in the style of the Japanese art that had initially inspired me. My tastes have evolved throughout the years and that is apparent from the various styles in my collection. I like that each stage is still visible. As I got my first tattoos when I was very young, it wasn’t until much later that I started to think about placement and the relationships between the tattoos. For me, my collection didn’t really start until I started to appreciate the style and skill of individual artists—now I take advice on placement and composition from the artists who tattoo me. In 2008, I went traveling for two years. My first stop was Tokyo and there was an artist there I had been following for a while called Horizaru. Before flying to Japan, I emailed Horizaru to try and to get an appointment with him, but unfortunately his waiting list was over six months and he had no space to tattoo me. When I explained to him that I was flying from the UK and only in Japan for a short time, he invited me to his house on his day off so he could tattoo me there. At the last minute my bank blocked my card and I couldn’t withdraw any cash. When I called Horizaru to tell him I couldn’t make it because I wasn’t able to withdraw cash, he told me to come anyway and pay him whenever I could—I couldn’t believe how much he had gone out of his way to help me. I traveled out to the suburbs of Tokyo where he had a small studio set up in his very traditional Japanese house. Having never been to Japan before that, it was a very surreal but amazing experience. Another piece that holds an interesting story is the red crested crane that Maxime Buchi did on my leg. On the way to my appointment, I was knocked off my bike by a car near the studio and hurt quite badly—but I was determined to make it. I turned up to meet Maxime, bloodied and with a very sore wrist. After reassuring him I was okay to get tattooed, we started the session. I went to hospital the next day and it turned out I had broken my wrist in the accident (but obviously the tattoo was more important). The most obvious difference is how people react when I first meet them. 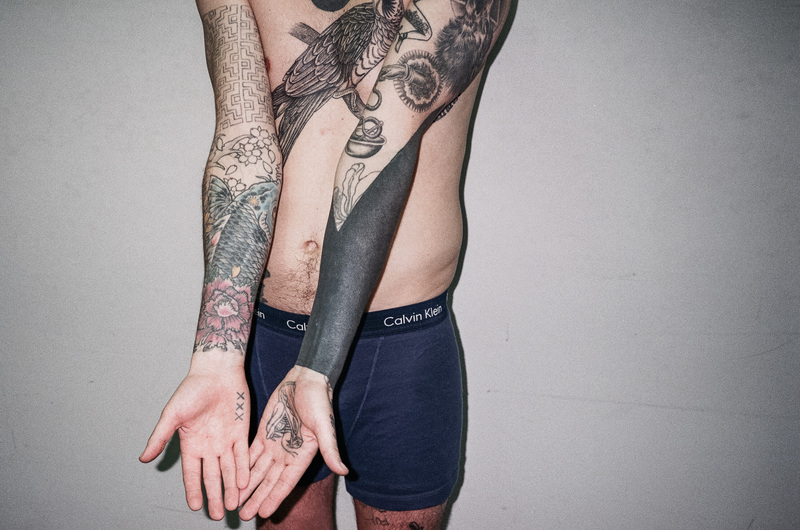 People are often very keen to talk to me about my tattoos, particularly about my black-out. Even complete strangers will approach me to talk to me about them. Generally they are well received, and people are genuinely interested. Another interesting result of being more substantially tattooed is becoming part of a kind of community. 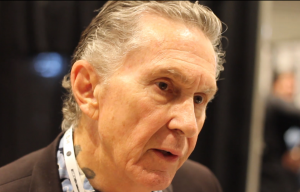 Artists and other people interested in tattoos will often recognize some of the pieces I have and speak to me about them. I’ve made friends all over the world because of my collection. Generally, I choose any tattoo I get based on the artist and what they do best. Being interested in tattoos, I regularly look at work from loads of studios and artists and, if I see someone with a style I really like, I’ll pick the subject matter of the tattoo based on what they enjoy doing the most. My collection is more about having pieces that are truly in the artist’s style, rather than asking them to adapt their style to create something I have thought up. I was in Barcelona back in July this year and stopped in at a studio there to see an artist that I know. While I was there two people came up to me at separate times to talk to me about my tattoos, as they’d recognized some of Antoine Larrey’s work. It was a surreal experience being recognized by strangers in another country because of my collection. 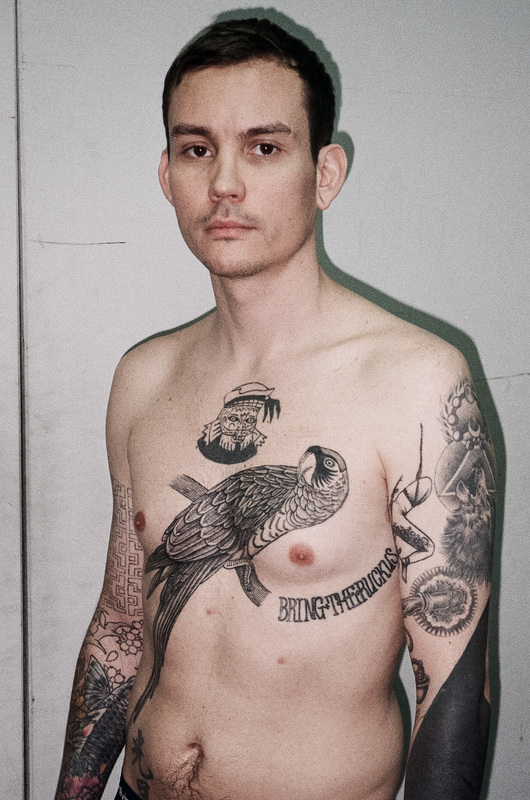 But it also turned out that one of the people was the tattooist, Alvaro Grozny; that encounter led to him tattooing my chest in London a few months later.